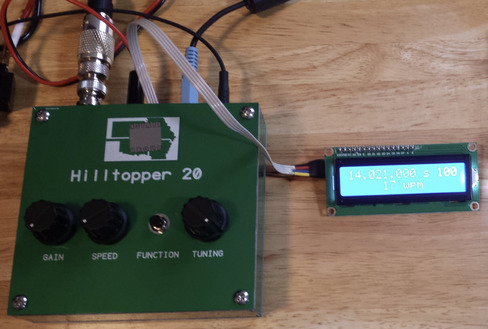 Lloyd Milligan- WA4EFS- has added a Serial LCD to his Hilltopper. He was kind enough to share a picture of his setup and modified source code for it. Thanks, Lloyd! Files are attached.. I haven't had a chance to try the source code, as I don't have a 16x2 serial LCD...yet. Hmmmm... I extracted the code and added it to my HT-30 code but it doesn't seem to work. I show 4.5 volts on the two pins closest to the front, and I know my I2C display works, or at least lights up, with another experimental device. But it won't light up up with the display I have and it seems to freeze up the processor. Perhaps this device is incompatible? I would be interested to find out from Lloyd what display he used. Mine looks the same but it's sure not working! Maybe you have an adapter that uses a different I2C address. On the internet one writes that there are different adapters with different addresses. That's the way it is with me right now and works. Here is the modified code with the "other possible" I2C address. I’ll look into that, but it bothers me that it won’t light up. According to my voltage measurement, it should (and does with another device). I’ll look into it some more. The light can be switched on/off via i2c and is turned on at initialization. Well, progress. I got the LCD to light up, but no data. I’ll look through the code again and make sure I got everything into it. The wiring sequence was helpful. I had it wrong before. Wonder if I cooked the I2C bus? I think I have a fresh unit that has never been out of the package that I can try. Well Martin, BINGO! We have liftoff! I thought it hadn't worked but with the change and readjusting the contrast, there it is! So I now have the *only* functional Hilltopper for 30 meters AND with a display to boot! So I have decided that I would like to make my display outboard and pluggable. If anyone has thoughts on a connector that wouldn't require hacking the board apart too much, let me know. I considered a 3.5 mm plug and jack; the plugs are readily available, but a chassis jack to mount on the side of the radio is elusive. I will mount the display in a separate enclosure. This way, one can either use it or not, depending on the circumstances. It also could be used interchangeably with any of my three Hilltoppers. The other thought I had was adding to the display "RIT" that either reflects "off" or the ∆f when engaged. Of course, that could take me days - or years - to figure out! I also considered a 0.96 inch square OLED in place of the LCD. It could almost surely be made to fit in the case. However, it was pointed out to me that such a tiny display demands good vision, and might not be bright enough for outdoor use. Anyway, to mount it neatly is beyond my skill level. Video demo: http://lloydm.net/Demos/Hilltopper/OLED-demo-raw.mp4. Code modifications are different for the OLED. –Just thought of another possible advantage, though. 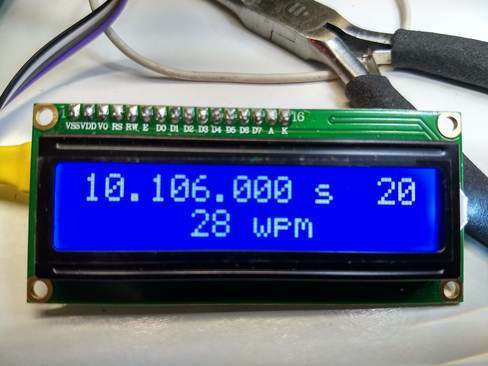 The OLED display can accommodate more than two lines of text (RIT? )… Of course the same could be done with a 4-line LCD. PS: If anyone wants to experiment with a 0.96-inch OLED I will be glad to send sketch modifications for displaying the same data as the LCD displays. I am very interested in the modified code. It would be nice if you could provide it! Sent to your QRZ Email address.